Bali News: Bali will have a new toll road. 4 toll roads prepared to be made in Bali. The new toll roads are planned to be built is the Kuta-Canggu-Tanah Lot-Soka Toll Road, Soka-Pekutatan Toll road, Pekutatan-Gilimanuk Toll Road, and Pekutatan-Lovina Toll Road. Construction of a toll road in Bali is very urgent for realized. Because Bali has become the region with the number of the number of cars are very fast. The number of cars in Bali each year continues to increase. However, the increase of roads has not increased. The impact is traffic congestion that can not tackle well. Four toll roads connecting the North to the South Bali with a total length of 156.7 kilometers is planned to be built in Bali. This toll road will pass in seven districts and four regency. The regency is Jembrana, Tabanan, Badung, and Buleleng. 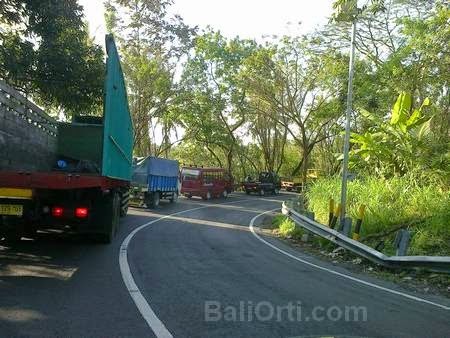 One of the most common path traffic congestion in Bali is Denpasar-Gilimanuk highway. Lots of vehicles from Gilimanuk to Denpasar will be stuck in traffic jams. It happened because the line was very crowded, and the terrain is very heavy to be passed by a truck with a heavy load. The national highway is projected for completion in late 2019. Waskita Karya become one of the state who are members of the Toll Road Enterprises. The survey results indicate southern Bali has been very solid and inequality development occurs with the northern region. Development of four toll roads is an important part of the accelerated and equitable development in the area of Bali. The total length of the four toll roads reached 156.7 km. The details are Kuta-Canggu-Tanah Lot-Soka (28 km), Soka-Pekutatan (25,1 km), Pekutatan-Gilimanuk (54.4 km), and Pekutatan-Lovina (46.7 km). The consultant has carried out a survey pre-feasibility study that focused analyzes the development of the region, traffic projections, and the selection of alignment. They also consider a review of the environmental aspects, technical and construction cost estimates, economic and financial analysis. Bali governor appreciates good idea of the construction of this toll road. Therefore, the provincial government of Bali has often proposed the construction of toll roads, but never responded to by the central government. If the construction of toll roads in this area can be done, then the region will be Pekutatan-Jembrana benefit the surrounding community.